15 3/4 by 31 1/2 by 15 3/4 in. 40 by 80 by 40 cm. Overall, framed: 100 3/8 by 224 3/4 by 2 in. 255 by 570.9 by 5.1 cm. 144 by 564 by 5 in. 365.8 by 1432.6 by 12.7 cm. 166 by 315 in. 421.6 by 800.1 cm. 66 15/16 by 55 1/8 in. 170 by 140 cm. 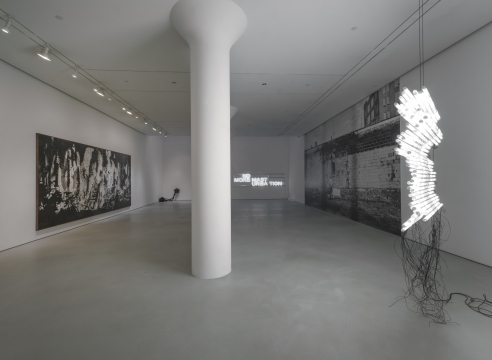 Mitchell-Innes & Nash is pleased to present RE pleasure RUN, an exhibition of new works by Berlin-based, Italian artist Monica Bonvicini. The exhibition includes painting, photography, neon works and a large-scale installation, showcasing the artist’s interest in the relationships between gender, architecture and the power dynamics that shape our world. 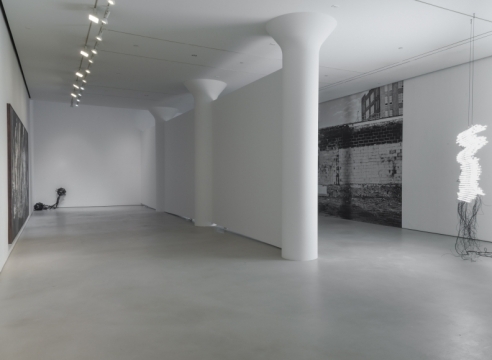 The exhibition is Bonvicini’s debut at Mitchell-Innes & Nash. 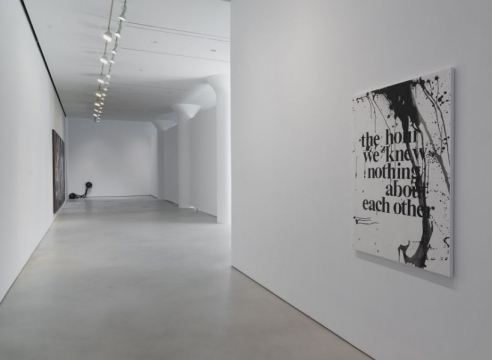 Best known for her large-scale sculptural installations that engage architectural space and the viewer through dry humor, Monica Bonvicini rejects categorization and questions elements of control, gender, and power embedded in images, language and physical space. 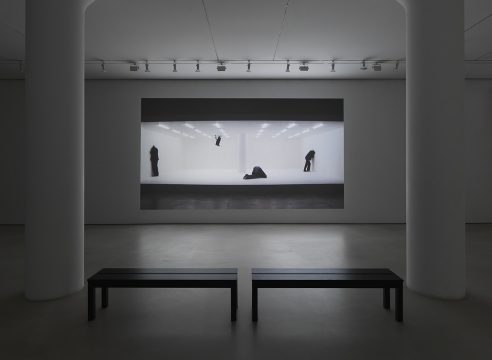 The exhibition at Mitchell-Innes & Nash will be anchored around an installation titled Structural Psychodramas #2, in which the artist uses temporary walls in the gallery to create a new architectural environment. The walls will be bare and slightly lifted, supported by small murano glass sculptures underneath. As the title suggests, the work is part of a new series in which the artist uses the walls of institutions and galleries to undermine the structural functionality of such places, while also prescribing them with an open possibility for an imaginary performance. 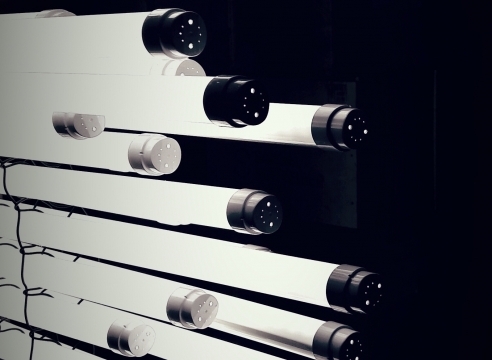 In addition to the central installation, Bonvicini will also present two large-scale neon light sculptures. 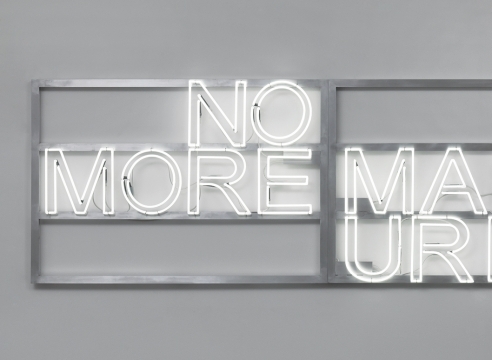 One neon sign boldly reads “NO MORE MASTURBATION”. The sign issues an imperative to the viewer but also raises a question about the significance of desire and pleasure in the current hyper-capitalist moment: is pleasure possible without the goal of productivity? This sculpture, as well as the title of the show RE pleasure RUN, is part of Bonvicini’s ongoing investigation into language and its legitimacy as an absolute form of communication. Two monumental pictorial works will occupy the gallery’s east and west walls. 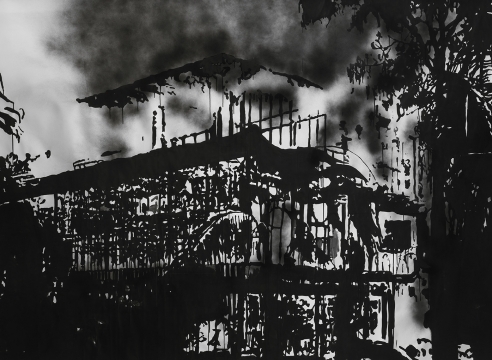 The first, a black-and-white varnish painting in four panels titled Mountain Town 2015 depicts a California house burning from a wildfire, its structure reduced to a bare framework. Beginning with a series of disaster paintings in 2006, notions of catastrophe and destruction have been recurrent themes for Bonvicini. The present work belongs to a more recent series focused on man-made catastrophes, mostly homes being destroyed by natural causes, which are the consequences of the effects of global warming. 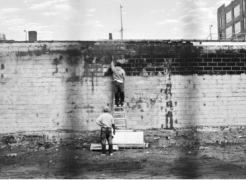 The second large-scale image is a wallpapered photograph that depicts two male workers building a brick wall. The image recalls a billboard advertisement, but without geographical identifiers and with the workers faces obscured. 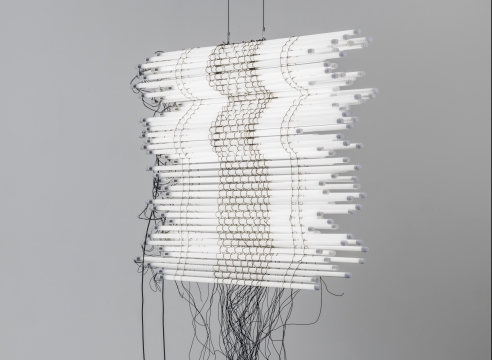 While Bonvicini takes advantage of disparate materials and mediums, her works as a whole function as equally significant aspect of her practice. Through an ongoing engagement of physical and psychological space, the viewer becomes an integral, yet indiscernible, part of the work.